“Hardwork, focus and determination will get you to where you need to be” said APJ Owner and Trainer “Kap” Patterson. With two of its fighters, Tyriece Stokes in 178 lb.division and Dominique Crowder in the 123 lb. division, to the New York Daily News Golden Gloves championship, the APJ Boxing Club is relishing on the moment and want to ride the momentum to carry their boxing gym to the next level. After falling short in semifinals for the past two years, Crowder, earned the revenge he was seeking when he defeated Ariel Lopez from Gleason’s gym in Brooklyn, NY and is heading to the National Golden Gloves tournament in Salt Lake City, Utah on May 16th. Stokes, fell short in his title bout with Patrick Aristhene from Freeport PAL. Although he lost in the finals, Stokes has appreciated the lesson from his title fight and hopes to make the third time a charm similar to his teammate Crowder and capture the “Gloves” in the upcoming year. Both boxers and their trainer “Kap” Patterson recap the experience at the Golden Gloves and what it meant for APJ Boxing Club. The trio along with the many fighters who train in APJ daily, are all working toward enriching the boxing culture amongst the city of Poughkeepsie, NY. With the city’s first NY Daily News Golden Glove champion, it will certainly expand the sport along the small city on the Hudson River. In 2012, Kariym “Kap” Patterson envisioned the APJ Boxing Club, searching to bring something unique to the City of Poughkeepsie. Years later, Patterson’s dream has come into fruition as APJ Boxing Club continues its initiative to take youth and adults off the streets of Poughkeepsie and into the boxing gym on Catherine Street. I had the opportunity to speak with Patterson and the fighters of APJ as they prepare for their 2nd annual boxing showcase, Upstate vs New York City . 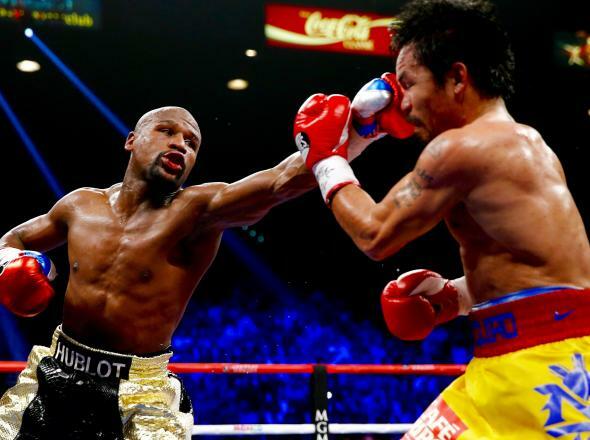 Years in the making, spectators and fans got what they were asking for Manny Pacquiao versus Floyd Mayweather on the big stage in Las Vegas. But many were upset including myself. Not because the fight was not a slug fest or similar to any storybook imaginary ending that those thought it was going to be. It’s because that we are getting ready to witness of one greatest athletes/entertainers make his final appearance on the grand stage. “Money Mayweather” is closing on his final fight in September, and causal fans and boxing purists will not get to witness one of the greatest in and outside the sports showcase himself again. The self-proclaimed GOAT has fought off critics throughout of his career due to various reasons including his domestic violence issues or even his outlandish antics outside of the ring. But when your remain undefeated after going toe to toe with the greats among your class and continuously prove your claim to be the greatest its not argument why he has the confidence or arrogance Mayweather sports. In the fight where he had the closest competitor “Pac Man”, “TBE” gracefully put one on an exhibition against Pacquiao , time and time again making his rival look like amateur. Mayweather’s ability to control his opponent with cross and his height and not to mention his adept defensive tactics propelled him to 48-0 and once again on top of the world boxing ranks. Now that he is final stage of his star studded career, Mayweather is set to relinquishing his belts and claiming “I’m a world champion in two different weight classes. It’s time to let other fighters fight for the belt.”After holding the grips to the belt over the past decade, the sport is set to find a new leader as the balance of powers has been restored. But as I stated previously in Bringing It Back, Boxing is making its revival as you see many networks including NBC and Spike have jumped on board to witness the sport once again remain prevalent. The question now remains, Who is going to be the next fighter to become Mayweather’s predecessor or predecessors? Who is going to be the guy that makes people have fight parties and control a PPV card ? I would personally like to see heavyweight fighters rise to prominence again with fans wanting to see slugfests and knockdowns. But I am anxious to see how Mayweather brings other fighter to spotlight that he holds with his ability as a businessman along with the control that he has over Las Vegas. It will be great to witness and is something we will be on our edge of our seats to see.